This workshop will encompass the principles of good painting: creativity, color, value, shape, composition, drawing, edge and variety. Twenty-plus years of plein air experience and years of teaching has allowed Victoria to distill the process of painting into learnable techniques. Experienced painters as well as beginners are welcome; Victoria likes to make her workshops fun as well as informative. And for subject matter we really can't go wrong in the visually rich Cinque Terre area of Italy...A Unesco World Heritage Site! among the sights and sounds of beautiful seaside villages: fishing boats, vineyards, centuries-old buildings, winding streets, texture and vibrant sunlight. in the warm ambiance of the mountainoue seaside, overlooking the Tyrannean sea...almost unchanged for centuries, one of Italy's jewels. great Italian food, delightful wines, new friends, breath-taking vistas, history and the hospitality of the people of the Cinque Terre. Experience the thrill and beauty of a wonderful part of Italy, and even more so, taking these memories you've created home with you! This workshop is for beginners to advanced artists and will be conducted outdoors on location. Workshop is open to painters of all levels. Whether you are a novice just learning to mix color, or a professional needing advanced problem solving, Victoria’s individualized instruction will address needs at your level and push you to the next step in your personal development. **Included with "Hotel" plans only, see details. Accommodations may differ based on availability. All-inclusive starts at US$3190.00 per person, double occupancy. *All-inclusive plans are Pensione Sorroso plans only. Limited spaces remain for this workshop!! 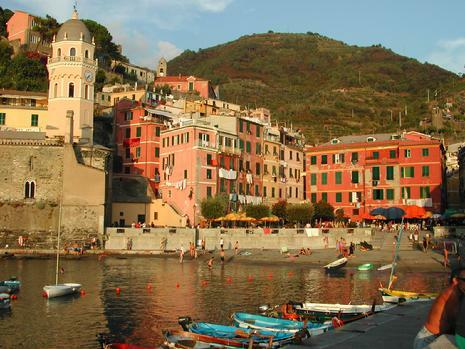 Note: Travel from Vernazza within the Cinque Terre towns is by train and/or boat. Depending upon weather, timetables, etc. On Saturday September 14, 2013 our group will meet in Florence at Santa Maria Novella train station in the city center at 11:00a. Our meeting location will be announced at a later date. Our planned departure is at 11:57am on Regionale train #23357 (Florence to La Spezia). We will change trains in La Spezia, taking Regionale train number #24514 to Vernazza, arriving about 3:36p. Specific platforms and tracks for departures will be determined prior to departure. We will have all train tickets for workshop participants. 14 panels– (7)-8x10, (7) – 6 x 8 panels. If you are more experienced you can use 9 x 12 and 12 x 16 (no larger). Fredrix Canvas makes nice linen and canvas panels: see www.jerrysartarama.com, (800) 827-8478. For a high quality custom panel that is very lightweight order #66 linen to be mounted on museum board visit: www.newtraditionsartpanels.com. (801) 732-0208. Holds up to 6, 8x10 or 6x8 wet panels – visit www.raymarart.com. (888) 809-3314. Please bring an array of newer bristle brushes. I use mostly flats and brights, sizes #2 to #12 would be good. One round #2 for drawing. Robert Simmons or Utrecht #409 are good. No stiff or worn out brushes. Bring a canvas brush roll to hold brushes. Sheets of wax or palette paper to put between wet paintings in luggage. Umbrella that attaches to easel (the Collapsible Umbrella, DickBlick.com. ½ box French Easel OR one that is called a “pochade box” (it attaches to a camera tripod) visit www.openboxm.com, (800) 473-8098. (I use an 10” x 12” pochade). www.judsonspleinair.com (866) 762-4233 for catalog. “Filling your Paintings with Color and Light” by Kevin McPherson. All paint, palette knifes, paint scrapper plus extra panels and tripod go in the bottom of your clothes luggage. Carry on your rolling backpack with all of your other equipment. Wear dark colored clothing so as not to reflect bright colors onto your paintings. One pad of Aquarelle Arches block, 12 x 16 140 lb. cold-pressed, or a comparable pad. Please bring an array of newer brushes. Pointed sables, #2, 4, 8, 14. Flat wash brushes, ¼”, 1” & 1 ½” (Langnickel, Nake or Japanese are fine). No stiff or worn out brushes. Canvas or bamboo brush roll to hold brushes. www.openboxm.com, (800) 473-8098. (I use a 10” x 12”pochade, don’t get the carrying case). (Some watercolor artists use their lap or existing tables etc for their easels).